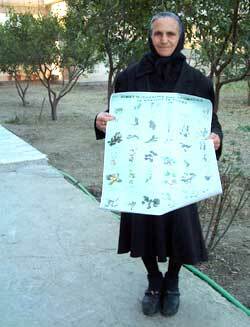 This poster identifying useful aromatic and medicinal plants was sponsored by Transrural and widely distributed as an educational aid. Herb gathers with "mountain tea" plants, which they collect and dry for onward sale. 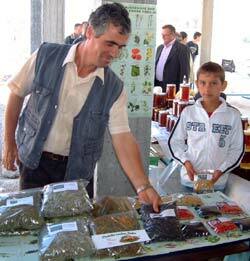 In the mountains of northern Albania , where the soil is poor and options for earning a living are very limited, the rural people have traditionally gathered herbs and other useful plants from the hills, not just for their own use, but also to sell. In the past this was carried out on a small scale, and during the Hoxha regime, was under government control. Since the early 1990's, anyone has been free to "wild-harvest" and local environmentalists and farmers have begun to realise that many species are declining. Rarer plants such as yellow gentian have become virtually extinct and even common plants have become difficult to find. Stripping the hillsides is also contributing to erosion. 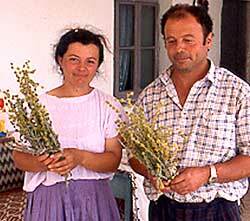 A group of farmers approached the Rural Associations Support Programme in Tirana and Transrural Trust to ask if we could help them with a strategy to combat the over-harvesting of aromatic plants without disadvantaging the families who rely on the herb trade for part of their income. As a first step, we helped them set up a Herb Growers' Association to provide a forum for all those connected with the herb trade. The association gradually assumed many roles. It supported farmers who wanted to grow herbs instead of wild-harvesting, distributed seeds and plants, organised training, provided information, oversaw the planting of a demonstration area and the establishment of a community nursery. Then we helped them to mount a campaign in the community, based on the international code of good practice, to raise awareness of the problem and to show people how they could collect leaves and berries without harming the plant. Farmers and advisers pointed out that it is often young boys who carry out the harvesting while they are out with the flocks and they are less likely than adults to gather carefully without harming the plant. 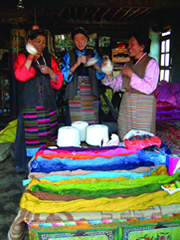 Information materials for local schools were produced as a result. For those more concerned with the trade than the environmental implications, we introduced the concept of the "traceability" of plant materials, soon to be an EU requirement for the European herb trade. Statistics comparing the distribution of plants in the northern mountains over recent decades are difficult to obtain. Few botanical surveys have been carried out in the area. We base our results firstly on the number of farmers opting to grow herbs. To date, 20 farmers are growing a variety of aromatics, including sage, thyme and oregano, often on hillsides that used to be bare soil. Secondly, on improvements in the quality of plants brought to the "gatherers" who dry the fresh herbs. They are reporting less extraneous plant material such as stalks and this demonstrates increased care in harvesting. There will always be the temptation for families to scour the hillsides to supply the traders who come from other Balkan countries. More work is needed to find an alternative that preserves plant life without destroying livelihoods. 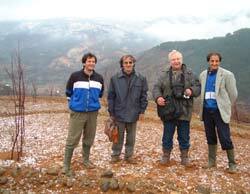 Although this initiative is far from solving the problem of over-exploitation of natural resources in the mountains of northern Albania, it demonstrates a particular approach to the issue, which with further funding could be replicated in mountain areas throughout Albania and serve not only to improve local incomes but also preserve the biodiversity of a country renowned for the richness and variety of its flora. Grant funding from the Small Grants Scheme via the British Embassy, Tirana; DFID Civil Society Challenge Fund and Transrural sponsors. Thanks to volunteer advisers Anthony Lyman Dixon and Tom Davies.